In what feels like a 90s throwback indie movie, “Jobe’z World” is a diversion from the modern era of big budget blockbusters. Set in New York City (Planet Earth) throughout one night, it’s a trippy, chaotic, comedic thriller that feels like it could be something more, but doesn’t quite hit the mark. Jobe (Jason Grisell) is a middle-aged Rollerblade who once had dreams of going pro. He works a job delivering drugs in the dead of night when the world should be partying, not working. One particular night, he is tasked with delivering to one of the most famous actors in the world, Royce David Leslie (Theodore Bouloukos). That night turns into a disaster when Jobe is blamed for the overdose of Leslie. Confused and afraid, Jobe spends the night evading paparazzi, police, and fans of the famous Leslie, fans who are mourning and want revenge. 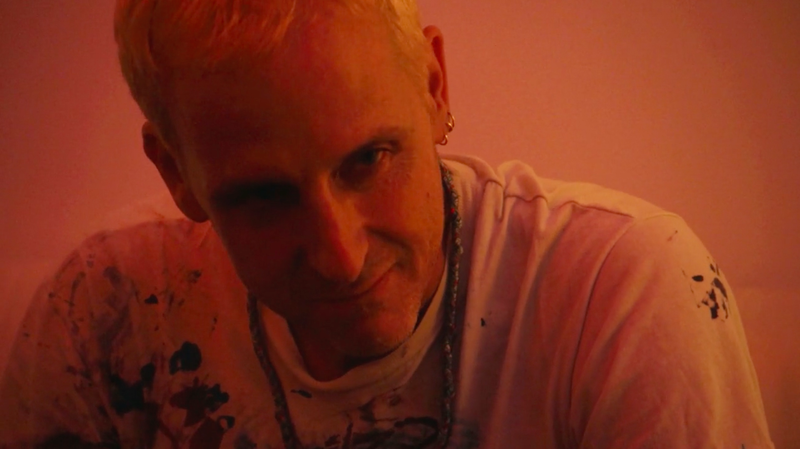 Written and directed by Michael M. Bilandic, “Jobe’z World” is a tight little thriller, with some interesting themes. At a mere 67 minutes, the film gets right to the action and doesn’t allow a lot of time for filler, which is a shame, because it could have benefited from some more time to breathe. That’s not to say that the movie isn’t entertaining, it just could have used a bit more time developing the relationships and the story. The actors in this film do a great job. Jason Gris ell is exciting and believable as Jobe, and I was invested in his dilemma. Bouloukos is fantastic as Leslie and reminds a bit of Orson Wells in his later days. The random people that Jobe interacts with throughout the night in the city are also well played. Except for some questionable dialogue, they do good work portraying these characters. The cinematography by actor Sean Price Williams, who also acts in the film, is exceptionally well done. Racing through the night in New York City, it’s chaotic and serves as its own character in the movie. It has that feeling of early Spike Lee or Larry Clark, with their films also using the camera to tell the story, and using New York as the backdrop. Shot on a micro-budget, “Jobe’z World” has many things going for it. Bilandic does a great job directing, and everything looks and feels great. With the exception of the script, everything about this film is solid. Good performances, great style, and a pretty cool story. But when it comes down to it, the execution of the script is what drags the film down. It starts out on a bazaar, promising note, that never truly pays off.